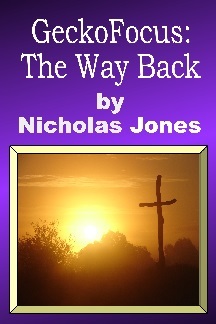 The Way Back: A focus on Jesus. After Game Start (why we need Jesus), and Game Over (what Jesus will soon do), it’s time to put the focus on what Jesus has done on the Cross. But for me, the Cross is the place I started. I have also released this collection in the adjacent eBook: “GeckoFocus: The Way Back ”. Just two rules and no angry God in sight. See everything unfold through just one rule for absolute simplicity. Just two options left and plan A failed. See plan B. Restored to the days of Adam. No longer academic but real and personal. Re-discover the intimacy of His ways. God makes Jesus victory permanent. Just two things to remember. Not just forgiven but made righteous. It makes all the difference. Look again and see that Jesus was never punished. It’s about feeling what God feels. It’s about resonating with the focus of heaven.